Slicing through Civil War history is not unlike cutting through a layer cake. The icing represents themes of grandeur and glory, the first layer, the epic battles and their heroic outcomes. The next layer represents the decorated heroes and martyrs, the major players. Following them are the histories of the Armies, Divisions, Brigades, and their bold leaders. Finally, and after all else, come the stories of the common soldier. What is frequently overlooked, however, is that the stage upon which these great battles are fought, the land across which armies of tens of thousands surge, also represents the lives of the millions of civilians who depend on that land for their industry and survival. Their voices are rarely heard. And so it was with the women mill-workers of the small mill town of Roswell, Georgia, when William Tecumseh Sherman’s cavalry swept into town on July 5, 1864. After the mills were burned and all the industry destroyed, Sherman issued an unusual order, deporting nearly 1,000 of the female textile workers to cities in the North. The women did howl, but, until Deborah Petite discovered, their story in 1996, it was a silent cry. After years of research, which Deborah shared with us at the January meeting, their story has been meticulously documented and told in her recently published book, The Women Will Howl. With passion and emotion, the women of Roswell have found their voice through Deborah Petite. It was an inspiring presentation! 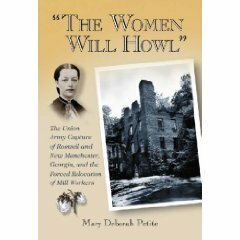 Mary Deborah Petite, a member of our Round Table since 1992, is author of The Women Will Howl. Information about Deborah and her book can be found at www.women-will-howl.com.